When I go into town, I tend to cut through BHS as it's a shortcut to the shopping centre from the car park. 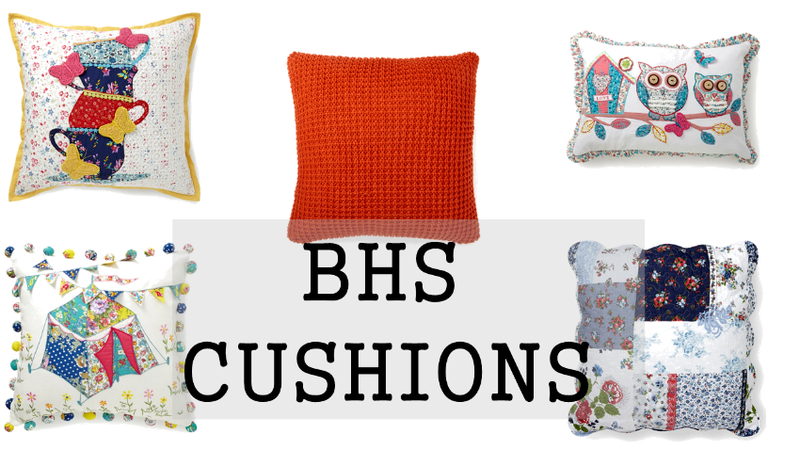 Just lately I have been really impressed with their range of homeware and in particular, I have been attracted to the cushions. They are really bright and colourful. Very seasonal. Most of the cushions, apart from the orange one in this picture, have a different backing to the front. Again, as colourful and pretty as the fronts. I really like cushions. They are a great way to update a colour scheme, or add texture to a scheme. I have loads of different ones throughout my home and even some in the garden. The 'tent' one with the bobbles is £20.00 and would look great on my rattan set, this summer. It contains applique and detailing. I also really like the detail on the teacups one- £20.00. The embellished butterflies and ditsy pattern are lovely. I picked the orange knitted one, in the middle, because this is the colour scheme I have downstairs and I liked how chunky the knit is. It is £16.00. The owl cushion is more oblong and one that attracted me for Lauren's young girl bedroom. It is £20.00 and would look fab sitting on her bed. And last, but not least, I love the denim and patchwork one. This has been reduced to £10.00 and would look great in any vintage inspired home. Trust me they are even nicer in 'real life'. I would love to own them all! OOoh I lurve cushions!! I think my favourite is actually the red one, mainly because it looks so knitted and cosy. But I love the other selections too! Great post!